Dimensions 0.75 by 6.50 by 9.25 in. Amazon.com description: Product Description: This book constitutes the refereed proceedings of the 20th International Conference on Conceptual Modeling, ER 2001, held in Tokohama, Japan, in November 2001. The 45 revised full papers presented together with three keynote presentations were carefully reviewed and selected from a total of 197 submissions. The papers are organized in topical sections on spatial databases, spatio-temporal databases, XML, information modeling, database design, data integration, data warehouse, UML, conceptual models, systems design, method reengineering and video databases, workflows, web information systems, applications, and software engineering. 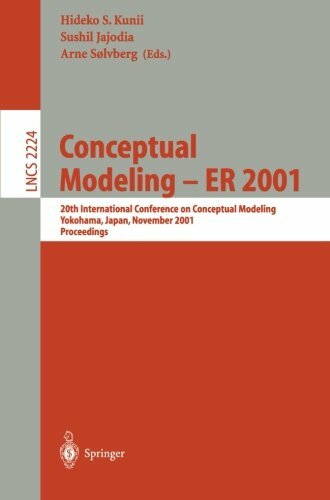 About: This book constitutes the refereed proceedings of the 20th International Conference on Conceptual Modeling, ER 2001, held in Tokohama, Japan, in November 2001.